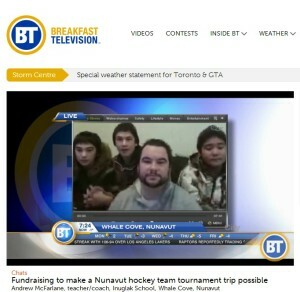 Our own Mr. Andrew McFarlane appeared on CityTV’s ‘Breakfast Television’ this morning to talk about the planned hockey tournament in March 2014 between our two communities. The co-hosts of the programme spoke very positively of Mr. McFarlane’s efforts and encouraged Torontonians to donate. As a result, the fundraising is well on its way to meeting goals. It is fantastic to see all of the support for this hockey tournament. Stay tuned as plans develop here at GCHS to welcome our Nunavut guests! This entry was posted in Uncategorized by gchswordpress. Bookmark the permalink. I think that our school should go all out and have a winter carnival the week that the boys are here to play hockey. Not only would it add to their experience, it will be something that our own students will remember for a long time to come. Subscribe to GCHS via Website!